Security Grilles, Roller Shutters | Acton, Ealing, Chiswick, London. Choose Acton Locksmiths in Acton, London, for the provision of dependable security grilles and gates. As experienced locksmiths, we know what it takes to make a property secure. We’ll provide the solutions you require in a timely, affordable manner. Electrically operated shutters are supplied with either a rocker switch, key switch, or remote control handset, as well as a manual override if required. Other operating options are available. These feature a double-skinned aluminium lath, which is comparable in strength to steel. Aesthetically, extruded shutters are very elegant, housed in small neat hoods. Steel shutters are more cumbersome, require larger housings, and are not so pleasing to the eye. Extruded shutters are therefore ideal for homes, offices, schools, community halls, and more. This double-skinned aluminium foam-filled lath (CFC-free) is available in a choice of powder-coated finishes and is electrically operated. This single-skinned aluminium lath provides suitable security when visibility is required. It is powder-coated in white as standard. Our retractable security gates are supplied in galvanised or non-galvanised steel. They are powder-coated in white, as standard, or available in a choice of numerous colours. Our collapsible gates are manufactured from pickets that are 16mm x 10mm x 3mm channel section. That makes them the thickest gate section on the market. 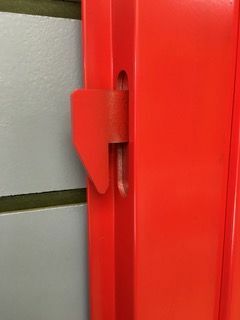 This is an extremely versatile security product, providing protection when closed and remaining unobtrusive when open. The bunch width takes up approximately 15% of the overall opening width. Lift-up or lift-out bottom tracks are available, as are a choice of locks. This security grille is designed for maximum security and as a permanent fixture, to be installed either inside or outside. Each bar is spaced at 125mm intervals between centre to centre of each bar. They are manufactured from 16mm or 19mm steel bars, set in a steel frame, and powder-coated. 12mm or 16mm square bar, in solid steel, is also available. This can create a brick or Georgian pattern. Alternatively, 12mm x 5mm flat steel can be used to match existing window frames, for example with leaded windows. Our bar gates are manufactured in the same fashion as our bar grilles. However, the process includes added hinges and locks. 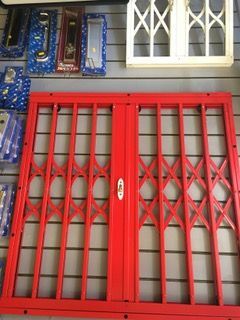 The bar gates can be transformed into an effective security grille for doors. Our standard lock is a CHUBB™ 3G114. 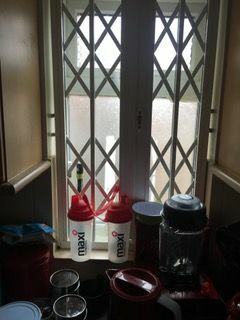 Other locks can be accommodated as required. Scrolls can also be added as a decorative feature. Cut-outs are available to accommodate handles, letterboxes, and more. Shopfront shutters are suitable for all types of commercial premises and domestic garages. There are many designs and colours to choose from, suiting all tastes and budgets. All provide exceptional security against vandals and burglars. Roller shutters can be manually operated with a spring roller unit, assisting in the raising and lowering, or electrically operated using an integral single-phase tubular motor. The curtains are made from various materials with a protective top casing, guide channels, bottom rail, and locks. The curtains of our roller shutters are made from galvanised steel or mill finish aluminium laths, or brickbond pattern grilles. The laths can have a perforated or punched-out design to allow your customers to view a shop display while still providing a high level of security and have polycarbonate infills to protect windows. Electric roller shutters can be linked to your alarm system and are operated using a key or remote controlled using a key fob transmitter. In addition to security grilles and gates, we also supply and install dependable safes and vaults. 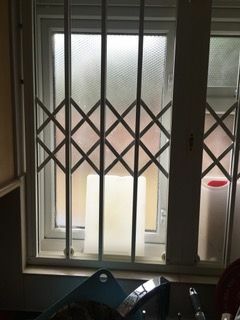 Contact us today, in Acton, London, for details about the security grilles and security gates we provide.